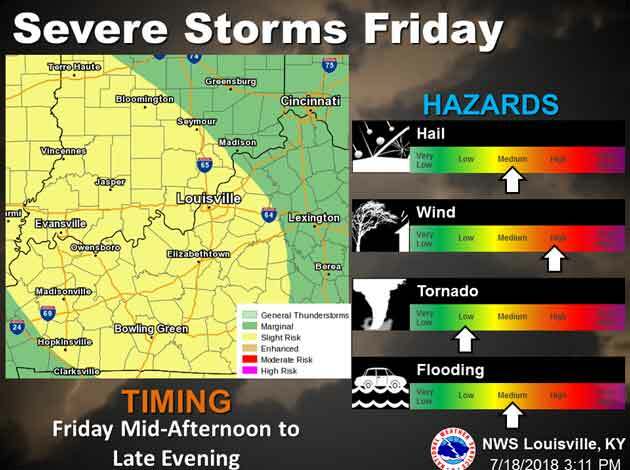 An unusually strong mid-July storm system will likely bring severe weather to parts of southern Indiana and central Kentucky Friday and Friday night. The graphic below has our latest thoughts. All hazards are possible – damaging winds, large hail, isolated tornadoes, and flash flooding. Stay tuned to the latest and our updates as we get closer to Friday/Friday PM. If you have any questions or concerns, please don’t hesitate to call/email.